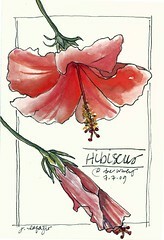 Here's the hibiscus that I drew, while showing my student. Jane, you have it going on! I admire your gumption. And your painting style.